Reclaim and recycle your water. Most commercial and industrial water is easily filtered and can be re-used. Reclaimed wash water removes the dirt but leaves in the soap. Save money on chemicals and water. Use Reclaim water instead of fresh for equipment and work area wash down. Fix leaks on fittings, fixtures and plumbing joints. One drop per seconds equals 20 gallons per day. Replace spray tips on spraying equipment. Tips wear out quickly and before you know it a 3 gpm (gallon per minute) nozzle is spraying 5 gpm or more. Use a photo-eye instead of a timer for precise on-off control. Turning on the water too soon or off too late wastes water. Install spring-loaded check valves or solenoid valves to stop the flow of water after each cycle. Water dripping after each cycle is water wasted. Use efficient equipment. Depending on your application, often high pressure low volume does a better job than low pressure high volume. Case in point high pressure spray arches. When using Reverse Osmosis equipment, capture and re-use the R.O. concentrate. It has already been pre-treated and filtered and works well as a pre-rinse to cut soap and wax. It is also good for irrigation, flushing toilets, and most other water applications that would normally use fresh. Just don’t use it to rinse windows and other surfaces because it could leave water spots. Reduce evaporation and carry off. Allow drip time for the water to fall into a catch basin instead of being carried off. High pressure water causes tiny droplets that are easily blown away. Walls or barriers to keep the water in help avoid unnecessary losses. Educate workers that water is money and if they waste it, everyone loses. Encourage employees to think of creative ways in your industry to save water. 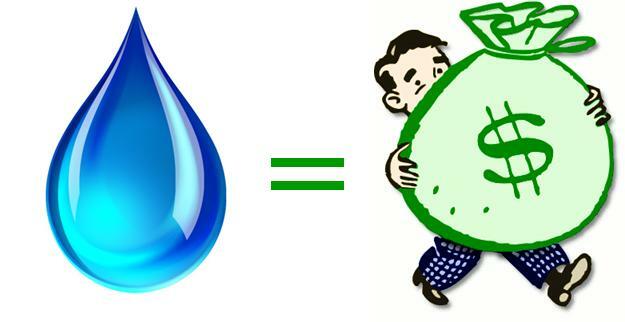 Incentivize water conservation. Installing water saving shower heads can save the average household from 500 to 800 gallons per month. Running only full loads in the washing machine and dishwasher can save another 300 to 800 gallons per month. I love to take a long shower especially on cold days but by shortening it down by only two minutes can save up to 700 gallons per month per person. Save another 150 gallons of water each time you use a broom instead of the hose to clean off the driveway. This also keeps dirty water from running down the street into the storm drain to where fish live. Some people use the toilet as a trashcan or ashtray, use the trashcan and ashtray and save yourself $$$ and from 400 to 600 gallons per month. Use a professional carwash to wash your car, save 150 gallons per wash, and help out the environment, the waste water from a carwash is recycled or processed through the sewer system and doesn’t end up in the storm drains, creeks, streams, rivers and lakes. Save up to 300 gallons per month. Install a two flush toilet one flush for #1, another power flush for #2. Turn off the water while brushing your teeth and save 3 gallons a day. Save 3 more gallons by turning off the water while shaving. If you wash dishes by hand advance three places and save 200 gallons per month. Advance three more spaces if you use a trigger spray nozzle to blast the dishes clean then shuts off instead of leaving the water run. Save 200 more gallons per month and collect the savings. We sometimes use a little too much dish soap, using too much requires more water to rinse the suds off. Keep cold water bottles filled in the fridge instead of running the tap until the water’s cold and save another 200 gallons a month. Defrost frozen foods in the refrigerator the night before instead of in the sink under running water, it’s safer and will save the typical family about 50 gallons a month. Use the sink garbage disposal less. Use the trash can or better yet Compost! Your garden will love it and you’ll save 50 to 150 gallons a month. Ideas were compiled from U.S. Dept. of Energy, EPA, Water Education Foundation, and just plain common sense and experience.